The parking lots filled up fast, so that by the time I arrived at Hohokam Stadium around 11 I was directed to park in the grass soccer fields south of the ballpark. With the construction debris gone and systems in working order, it was time to show off the renovated ballpark to the community. There were no surprises for me. I’ve checked out the place throughout various stages of construction over the last two years. What I wasn’t quite ready for was how it looked with a bunch of people in it, sitting in seats, traversing concourses, hoping for home run balls. For me that’s when it became more than a bunch of features and improvements upon Phoenix Muni or even the Coliseum. That’s when it became real. From the top of the stadium you’re afforded views of the McDowell Mountains to left, Four Peaks and Red Mountain to right. Down low it’s all baseball. 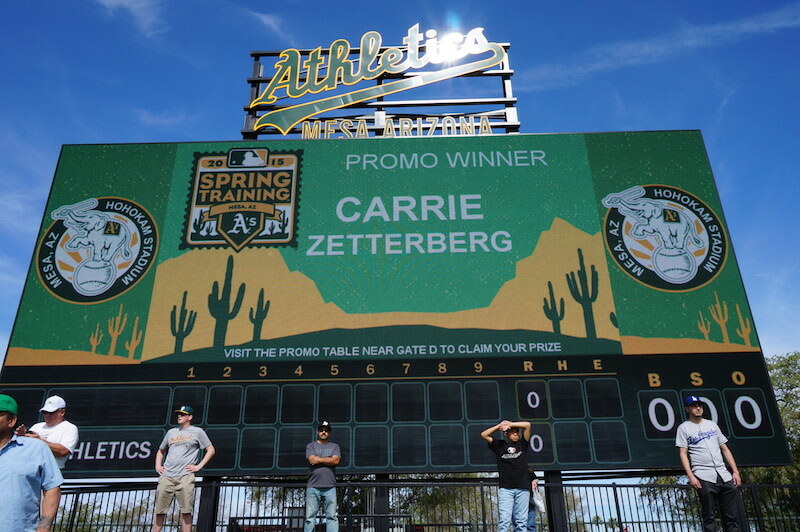 While the A’s have sold ads in the outfield, don’t expect the same kind of ad explosion you typically see in minor league parks and other spring training parks. The big scoreboard in left will probably be used for getting those messages across. If you had visited Hohokam at any time since its 1998 renovation, you know about the edifice’s underwhelming blandness. A 90’s ode to beige stucco, there were only the most minimal nods to the Southwest. Under the A’s, the Gensler-designed makeover is all green and gold. The exterior walls are the forest green we as A’s fans are very familiar with, perhaps darker than you might expect at first glance. Gold painted aluminum panels line the gates and box office. Originally the gates were to have famous player numbers, like 24 for Rickey Henderson. This was scrapped sometime in the last year, probably because having gates named in a “random” manner would look confusing to non-A’s fans. Not that the gate naming system matters, it’s unlikely anyone will get lost here. 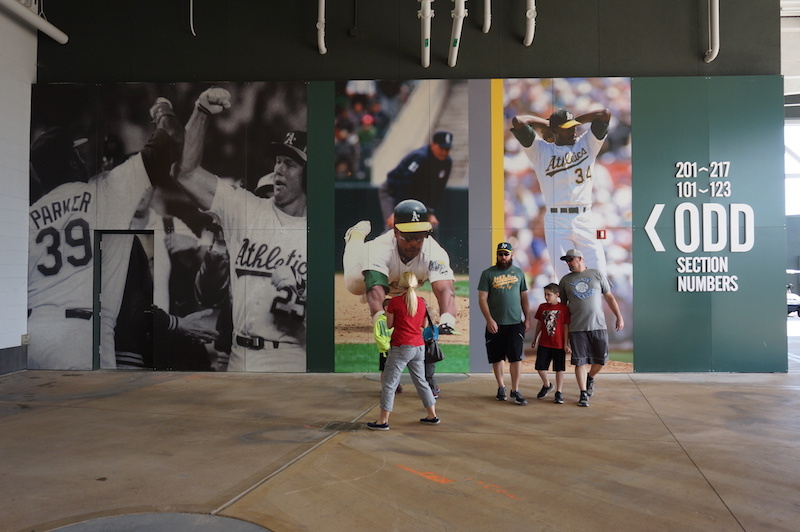 One bit of technology not available in the 90’s was large format, photorealistic vinyl, which was put to good use depicting major events in A’s history on the outside of the stadium (above) and throughout the concourse. The inner concourse felt somewhat cluttered with numerous memorabilia sales tables on both sides. Only a few concession stands were open, so the space was made available. Most of the concourse is white, with gold accents to highlight fan amenities, from tunnels to the grandstand to restrooms and concession stands. Ferguson Jenkins was even on hand, as he used to be when Hohokam was the Cubs’ home. Jenkins usually makes the rounds at every Cactus League park, so if you want to meet the Hall-of-Famer you’ll have your chance. Unlike Phoenix Muni, at Hohokam fans will now be able to walk completely around the park. As a 90’s-era Cactus League park, there’s no 360-degree concourse like the kind you’d see at the newest parks: Salt River Fields, Camelback Park, Sloan Park. Even so, you can get your full stroll on, and the upper tier is elevated enough above the walkway that you won’t have to worry about obstructing views. When Hohokam was redesigned, the Cubs made sure to get a large canopy placed over much of the seating area, as the old Hohokam had no shade whatsoever. That feature was carried over to Cubs/Sloan Park, and while the shade isn’t truly necessary for March in Arizona (75-80 degrees, dry heat) it’s welcome. If you want shade from the start, sit in the upper sections on the 1B side or behind home plate. The A’s also removed large bleacher sections down each line and replaced them with shaded patios, one a family and kids area, the other a beer garden. Along with the downsizing, all of the seats and bleachers. The plastic fixed seats are 19 or 20 inches wide, provided by Hussey Seating. Bleachers are contoured and have backs. Hohokam is 0.6 miles north of Fitch Park, home of the Lew Wolff Training Facility. The facility was not named LWTF in the initial drawings presented by Gensler nearly a year ago. Whether Wolff decided to do this at the last minute or was pushed to do so because of the drawn out Coliseum lease negotiations or other factors, the Wolff name is unmistakably on the A’s building in Fitch Park and on way finding signs outside Fitch. Wolff’s name is nowhere to be found at Hohokam, and both Hohokam and Fitch have retained their original names. Wolff turns 80 this year, so I can’t blame the guy for celebrating an achievement, no matter how distasteful it may look to many Oakland fans. The outfield berm areas at Hohokam are arguably the largest in the Cactus League. In right, the berm is so large that it’s split into a good-sized lower part and a large upper hill, descending to a second walkway next to the warmup fields. The A’s have plans to rework these areas to include a food truck alley and a grotto in left, but for now they’re being left alone. In any case, you’ll have plenty of area to stretch, and maybe the team will add more kid-friendly attractions with all the space, as is seen at Peoria. Last but not least, there’s the new scoreboard, which I’ve talked about previously. The A’s are experimenting with different graphics and sound packages, and from what I hear they’re not final, so you if you have suggestions chime in. One dilemma I heard about was whether to bring the “A*Team” theme and graphics over from Oakland or trying something different for Hohokam. I have a bunch of lawn tickets for games in March, and I made sure to plant myself in front of the display to see if I could stand the up-close pixelation. It looked fine to me, so I’ll make LF semi-permanent instead of RF, where I thought I’d be sitting prior to today. 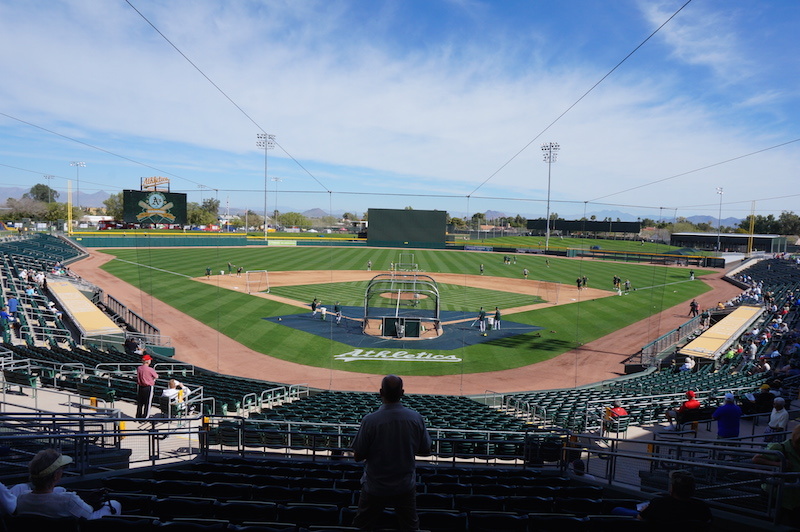 The final price tag on Hohokam Stadium was $27 million, $17 million from the City of Mesa and $10 million from the A’s. The original budget was $20 million. Some of the extra $7 million went towards technological improvements, such as proper wiring for broadcast video throughout the park. While the A’s and Comcast don’t broadcast a ton of games during the spring, it’s good to know that the capability is there. Visiting teams will be able to take advantage as well. A spring training ballpark is only used for a month every year. Games held there don’t count in the standings. It is more intimate than regular season baseball, more accessible. Every fan should take the opportunity to visit his/her team’s spring training home at least once. It’s warmer in more ways than one. This entry was posted in Athletics, Baseball, Feature, News, Travelogue. Bookmark the permalink. That is why if the Raiders get the Coliseum land..lew and company can play at one of their training centers…looks better fit for baseball anyway. I like what I see at Hohokam…good picture angles ML. would love to see those elements like numbering the gates to the park be implemented in any new a’s park that gets built either in sj or oakland. can imagine gates #24, #9, #43, #7, #27 leading into any new mlb park the a’s build. a’s org and fans deserve so much better in terms of the venues they’ve been stuck with over the past decades both at the major league level where the coliseum is a dying relic and even though many liked phoenix municipal that was probably the worst of all the az spring training venues. moving to hokoham def is a step up for the a’s franchise. hopefully before this decade is over the same can be said about the a’s big league venue too. ML, I was there also a few minutes after 11.Bought some tickets first thing. Were you by chance wearing a lynard w/ some A’s credentials and had a 35mm camera? Everything looked great decked out in green and gold. I have been there before. I noticed that the place seems a lot bigger. That outfield area is huge. Good size crowd at first. Lots of people took their kids to the carnival type event beyond the outfield. Before I left, the scoreboard said that there were 2 for 1 tickets available for purchase that day only. I inquired and they said it was just for the last two games. Out of money by then. Left at 1:23 to be exact. Had really thinned out by then and not much happening. No, I wasn’t credentialed for the event. I spent a lot of time sitting behind the plate, transferring photos from my camera to my laptop. Probably the only guy there doing that. If you had to choose, Phoenix Muni or updated HoHoKam. Not best for the team, just your personal preference. It’s Hohokam. Muni feels claustrophobic compared to Hohokam. While I loved how rustic Muni was, I would’ve gladly traded all that in for more modern, spacious digs, which is what Hohokam is. The best thing about Muni was how central it was. It isn’t that big a factor in the end. funny that’s an argument used in favor of the coliseum or at least coliseum site/oakland.